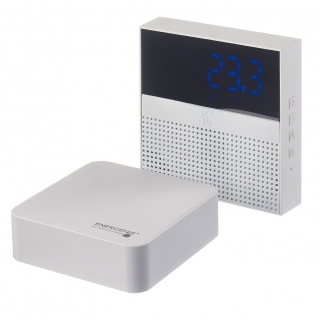 The Energenie MiHome products link directly to the MiHome Gateway (available separately) which provides the communications between your MiHome device and the internet. The MiHome Smart Thermostat with Gateway is suitable for switching any standard domestic boiler (see product specification below). The MiHome Thermostat connects to the boiler with a simple 2-wire connection and is battery powered. On-board controls to adjust temperature and turn the thermostat on/off are provided. The thermostat also senses occupancy and humidity which can be viewed in the App.